So you have just transitioned to the NBN or looking to move to the NBN network, not sure about what you need to do, or who to call for the right advice? Had your HFC NTD or FIBRE NTD installed in a place not suitable, or unpractical? Told you have no choice by the NBN Technician? Sorry, it has to go here!!!!! Know your rights on an NBN NTD installation !!! 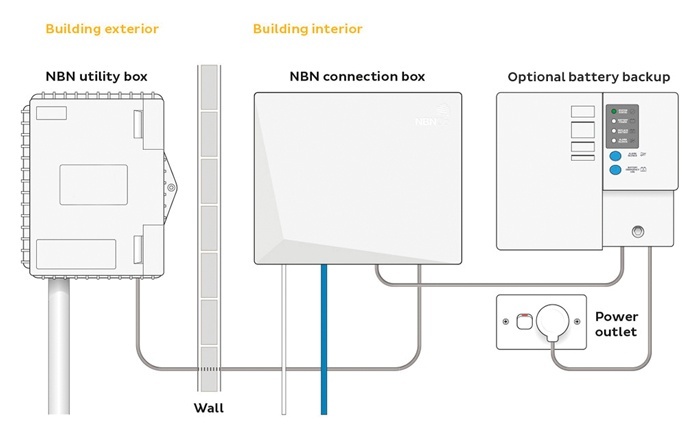 Under NBN's installation guidelines for HFC NTD or FIBRE NTD's, NBN Technicians must engage with the EU (End User) to discuss a suitable location to mount the NTD and Modem. If the Technician and the EU (End User) are unable to reach an agreement for the installation then the Technician must call NBN to advise, the onus is then placed on the EU (End User) to contact an accredited contractor holding an ACMA open licence with the appropriate endorsements for the cable type being worked on to install the cable from the PCD to the installation point, then re-book your appointment with RSP. If the EU and the NBN technician can reach an agreement on the installation location then and only then should you allow the Technician to commence the work. Remember on the completion of the installation the technician will ask you to sign a document, it may be on a tablet or smartphone. The document you sign indicates to NBN that you have agreed to the installation location of the NTD. Once signed you may have no recourse with NBN for them to re-send a technician back to relocate your HFC NTD or FIBRE NTD. Or they may re-send a technician to relocate the NTD at the EU expense. Things you can do before the Technician Arrives!!! 1. Identify the current installation location and determine what needs to be done. 2. Decide whether to move the NTD to a more suitable location. 3. Inspect new NTD location and work out a cable route to best suit your needs. 4. We then can install a new, RG6 coax, fibre or network cable to the new installation location point, from the PCD located on your external wall. 4. We then connect our test equipment, take reading to ensure correct signal levels are reached. 5. Reconnect all equipment and test for correct operation, check the status of all lights on NTD and modem. 6. Record all test readings document in PDF report. 1. Inspect existing NBN NTD location. 2. Identify the new cable route to the new location. 3. Installation of new CAT6 data cabling including new data outlets as required. 4. Supply and install CAT6 patch lead between data outlet and Wan port on Modem. 1. If you can't agree with the NBN technician on a suitable location don't allow him to proceed. 2. If the installation goes ahead and the NTD is installed in a different location that you didn't agree to DO NOT SIGN OFF. 4. Ask questions with the NBN technician, your RSP or call Us. 5. You can get the NBN technician to complete a temporary installation so you have your service activated, Call us to complete the installation.